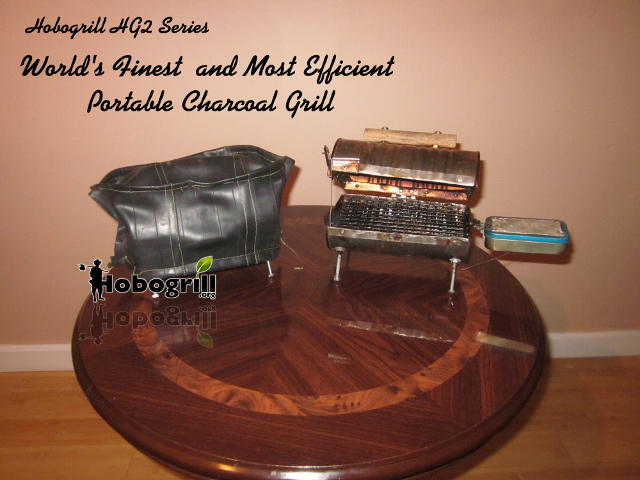 Pensacola, FL - January 16, 2014 -- The Hobogrill is a tiny, ultra efficient, ultra lightweight, portable, wearable charcoal grill which can be made mostly from recycled materials. Best of all, Sanghi Labs LLC, the company behind the http://www.hobogrill.org project is making the design freely accessible to anyone in the world willing to make their own for noncommercial use. The new Hobogrill HG2 series is only 7" long and 4.25" in diameter and weighs less than 12 ounces. The body is made from a tin can (such as that from sauce or broth). It can be worn on the person using a thin strap which can be made from a bicycle innertube which makes it ideal for hikers. The tiny grill cooks food more effeciently than a standard charcoal grill by minimizing the amount of fuel need to cook and by bringing the food closer to the heat source. Many times when people cook in a typical charcoal grill the food is removed from the grill with hot charcoals left to burn wastefully. This might not sound like a big deal but multiply that by each of 300 million people in America on the biggest bbq days of the year such as Memorial Day, Labor Day or 4th of July. For every single extra briquette burning in the grill per person in America on one of those days can amount to 135,000 metric tons of carbon emissions and wasted charcoal. The stark reality is that with traditional grilling many more than just 1 extra briquette per person is left to burn in the grill. Sanghi Labs LLC has quantified how much coal is required to adequately heat the grill's 29.75 square inches of cooking area per each of two sides. That amount is just 90 grams which is about 2 typical sized briquettes broken up into tiny pieces. To put this in perspective a 50lb bag of charcoal will yield 249 burns in the tiny grill -- the equivelant to cooking on it 3 times a day for 83 days. According to United States Energy Information Administration (eia.gov) coal contains approximately 19.51MBTU's per short ton which equates to whopping 466 watts (3.41BTU/watt) of cooking power for the little grill. The idea came about in part when the creator, Neel Sanghi, was researching options for a portable cooking aparatus so he himself could turn the romance of back packing the world into a reality. "I looked all over, and the portable camp stoves I found had a high cost of ownership because they needed costly proprietary fuels or they were just too heavy and bulky to be used for travelling, and most of them required too much setup prior to each use." said Sanghi. "There simply were no miniature single or double serving bbq grills to be found." The Hobogrill project addresses the fact that much of the world's recyceable waste is decentralized. Everyday worldwide there are literally millions of tons of tin and aluminum cans discarded which is used to make the main body of the Hobogrill. "The Hobogrill can make large impact on reducing carbon emissions worldwide, but only if it is accessible to everyone." says Hobogrill inventor, Neel Sanghi, who developed the first prototype in July 2012. "By designing a grill that can be manufactured from recycled materials and allowing anyone to make one for themselves makes the technology accessible to everyone." For this reason Sanghi Labs LLC, is releasing the free DIY instructions for the Hobogrill HG2 series under the Creative Commons 3.0 license which requires author attribution to the Hobogrill.org Project and allows for noncommercial use of the design. To help pay for the project Sanghi Labs LLC has resorted to the popular crowdfunding platform, Kickstarter. The Hobogrill project far exceeded it's funding goal within the first few days of it's crowdfunding campaign. The campaign offers a custom engraved version of the Hobogrill HG2 to project backers. Visit http://www.hobogrill.org for more information.